Inside: Are you looking for the safest baby bath products or kid’s products? These are the best tried-and-true natural, non-toxic baby bath products: organic baby washes, shampoos, sunscreens and more. These amazing products are not only safe according to the EWG, but they WORK. Start feeling good about what you put on your child’s skin. Some of the ingredients that are in our kid’s and baby’s mainstream bath products (such as popular Johnson’s baby products) are scary. We as their parents need to protect our kids from harm, and that includes what we put on their skin. Dangerous known cancer-causing chemicals such as formaldehyde and 1,4 dioxane can be found in popular, mainstream baby products. We need to be advocates for our children. Even “natural” products aren’t necessarily what they claim to be. 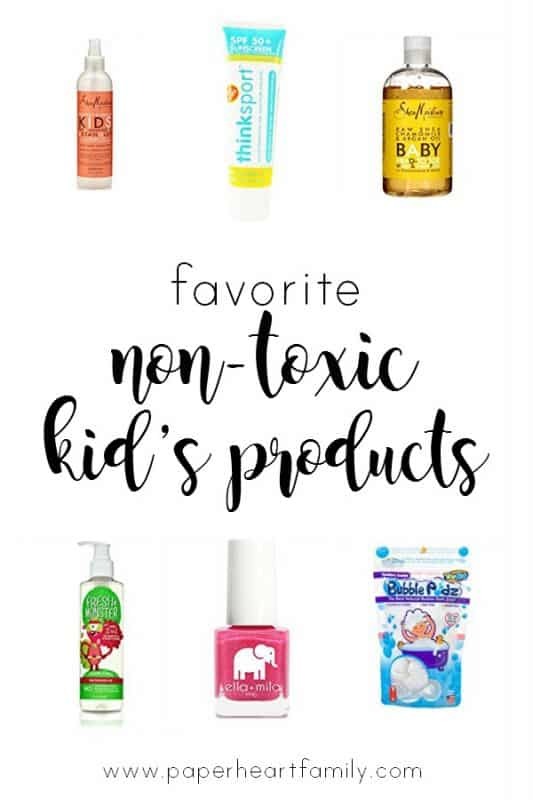 I rely on the Environmental Working Group when it comes to choosing non-toxic products for me and my children. However, I get it. Sometimes the safest baby bath products aren’t the best performing. It took me over three years to find a baby wash that I love (I tried many). Here are the products that I recommend. I LOVE these products, and use them everyday. Now you can give baby a bath with confidence that the products you’re using aren’t only completely safe, but they are also some of the best baby bath products available. I used many organic baby washes before discovering Shea Moisture, but never really loved any of them. This wash lathers very well, is moisturizing and it smells AMAZING. It’s also very safe and doesn’t irritate my daughter’s sensitive skin. About the company: I love Shea Moisture’s story. The company was inspired by the founder’s grandmother, who in 1912 sold shea butter as a 19 year old widowed mother of four in Sierra Leone (Africa). The company is now run by her grandchildren. Their products are natural, organic , cruelty-free and sustainably produced. You can’t deprive your child of bubbles baths, right? These bubbles have only 4 ingredients and come in their own little biodegradable pod (which totally adds to the fun factor. And could prompt fights because all of your kids will want to be the ones to dissolve the pod in the water). They smell fantastic (and have an eczema version too). About the company: TruKid was born when Jennifer, a mother of six (!) found two of her children applying her anti-wrinkle cream to their faces. I am seriously in love with this shampoo. It’s moisturizing, smells incredible, the packaging is adorable and it’s VERY reasonable. It’s a new company that I hope will be around for a long time. About the company: Fresh Monster was founded by two moms with experience in the personal care industry. They had previously worked with big corporations such as TRESemme and Suave, and were tired of two things: overpaying for their children’s hair care products and worrying about toxins in those products. I love this hair detangler because it smells amazing, and no matter how much I (or my kids) spray into their hair, it never looks greasy. It makes their hair really shiny, smooth and tangle-free. I have tried many types of sunscreen also, but many are hard to apply and to rub in. I bought Hang Ten Kid’s mineral sunscreen but later discovered that despite being a mineral sunscreen, it has an EWG score of 3. I have also used Babyganics which is rated 2, and it was okay, but not great. After looking on EWG for something readily available, I decided to try Thinksport Kid’s Safe Sunscreen. This sunscreen smells SO good, and goes on easily, unlike many mineral sunscreens. Compared to Banana Boat Kid’s Sunscreen: EWG rating of 6. We have Piggy Paint Nail Polish (EWG score= 1) and it’s great for young kids who want to peel the polish off anyway. I also have Ella+Mila for my older daughter. (It is not yet scored by the EWG.) It does have a little bit of a nail polish smell, but I feel much better putting this on my child’s nails than some popular drugstore brands. It is 7-free, vegan, cruelty-free and made in the USA. It stays on much longer than Piggy Paint, and the colors are really kid-friendly and cute. I love using coconut oil for my kid’s dry skin and hair and to make DIY Koolaid lip gloss. It’s 100% safe and very inexpensive (and if my toddler eats it, no biggie!). And if you’re breastfeeding, why not make some breastmilk lotion? What are your favorite safe baby bath products and natural kid products? Thank you for this!!! I have really been trying to pay attention to what I’m buying for my kids and this gives me new ideas!! Since I am a grandmother and only buying for babies now this is great for me personally. Keeping up with what is healthy and safe for the little ones when I do want to make a baby purchase. And it’s hard! There’s so much misinformation out there! I love the Shea Moisture products, thanks for sharing. Me too! I use them for myself also. We did make it, and the girls love it! And when they reapply 83 times a day, I don’t worry! Thanks for sharing these! Finding natural products for kids is overwhelming! It’s totally overwhelming! It took me years to find these products! I recently learned about the EWG ratings and I have started looking up everything on their site! I was actually surprised when I learned that one of the “natural” products that I was buying for my children had a horrible rating. It really made me learn that you cannot always trust marketing and word-of-mouth. You need to do your own research to learn what is best for your children. I love your product recommendations. The same thing happened to me. And if you watch a Johnson commercial, you are led to believe that their products are free of chemicals, which is definitely not the case. So frustrating! Oooh, I’ve been looking for a good detangler. I’ll give some of these products a try! It’s a godsend really. Now I do t have to listen to whining every morning ? I’m a huge Shea Moisture fan! I use it for everyone in the family! Thanks for sharing these products, I’ll have to check the rest of them out! She’s Moisture is definitely amazing! I need to check out Ella and Mila, my 4 year old always wants nail polish and I am hesitant to let her have it! I know what you mean. And then your kid gets that gift from a well-meaning relative that is nail polish or lip gloss from the dollar store! And you have to throw it away and hope they forget about it ? I should have mentioned that in the post! Seriously! My 2 year old would legitimately dump the whole bottle in. Bubble Pods for the win! We love Shea Moisture products! This is a great list. I try to pay close attention to what I give my child and what I use in them. I am such a fan of Shea Moisture. This is such a good post. I will be sharing. Thank you so much! Shea Moisture is awesome. Thank you for compiling this! It’s so hard to research all of these products. It took me a long time to find all of these, I know what you mean! Thanks so much! What a helpful list! Coconut oil is EVERYTHING in my house. Great post!! I love coconut oil for just about everything ? Great variety of products! I love ThinkBaby sunscreen! I used it all summer long on both of my toddlers! It’s the best mineral sunscreen and I’ve tried many. The scent is to die for! Great list of products here. It’s scary to know the amount of harmful chemicals some companies still make their products with. Very scary! I wish there were more regulations. These are great reccomendations! I use the EWG’s website ALL the time, but sometimes finding products available in Canada is tricky! I’ve been slowly replacing our cleaning and beauty products with healthier options. These are great recommendations!